FFP isn't your ordinary e-fed. Talented staff, creative storylines! One show a week...every Friday. 12 PPVs a year..
We have one weekly show, with a PPV every 6th week. We value roleplayers, and all shows are judged by panel for fair results. 2RP limit for weekly, 3RP limit for PPV. The RCWF E-Fed is a wrestling league that broadcasts its shows twice a week LIVE on the internet so you can watch the matches as they happen on Justin.tv! 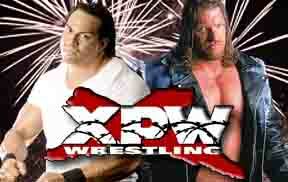 XPW has been around for over four years! We've got a great, thoughtful, and dedicated staff. A weekly show that is NEVER late, and a friendly atmosphere that will welcome the most experienced or brand new e-fedder. One of the greatest E-Feds ever have re-opened and are looking for members. It's a great, fun E-Fed with a great history and there are experienced and active admins. The great federation has once again shrugged off adversity and risen from the dead. With a new look and show, ICW hopes to again punch holes in its competition. Three years running and just getting bigger and better. Think you can handle the elite? Wanna be in a place thats drama free. Great rpers, great staff, great cards. Come on in. Give it your best! Once of the great E-Feds, and now it's reopening. With one show a week and a Max of 3 Roleplays, it's the perfect fed for both part time and full time players. New Fed.NO CAWS.One show so far.Great Staff.NEXT 5 PEOPLE TO JOIN GET A WWE TITLE SHOT!!!!! THE ORIGINAL HOME OF X-TREME IS BACK!!!! Now under a new name and forum. Originally XIW, Pure: Unleashed IS HERE!!! !